About forty percent of Hokuei’s known oeuvre depicts Rikan II who was a celebrity known for his versatility as well as his large, expressive eyes. He acceded to the famed Rikan kabuki family name in1828. This short-statured actor with the nick-name “Metoku” (i.e., eye virtue) may have had no dance skills but excelled at both romantic male leads and the onnagata, or women’s roles. Trans. John Fiorillo, “Surimono-Style Prints by Hokuei,” Impressions. v.20 (1998): 64. There is a fascinating and telling comment about a less elaborate version of this print illustrated in Osaka Prints by Dean Schwaab - page 155. 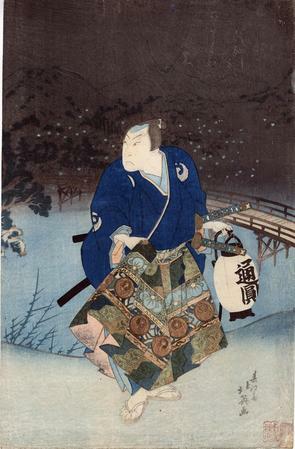 "This print illustrates the play that Rikan II performed immediately following the long run of Katakiuchi Nito Eiyuki and is, in fact, a companion piece to [#587 in the Lyon Collection, an Ashiyuki print - both published by Iden].... No role, actor's name, or poem is inscribed, and it is doubtful that a version will be found bearing such." [The bold type is ours.] Of course, one of the great things about the print in the Lyon Collection is that it does have a poem written in metallic inks and is a truly deluxe edition.